In a rapidly urbanizing world — over half the world’s population lives in urban areas, including many millions in informal settlement — the large cities of the developing world in particular are expanding. Yet there is little in the way of planning and preparation for this explosive growth in urban population. Making Room for a Planet of Cities is a comprehensive and original analysis of the quantitative dimensions of past, present, and future global urban land cover, culminating in a proposed new paradigm for preparing for explosive growth in cities the world over. Carefully selected metrics measured in four new data sets with ArcGIS software provide a comprehensive and consistent global and historical perspective on urban expansion. These data sets are:1. The built-up areas of a global sample of 120 cities with 100,000 people or more, 1990 and 2000, based on satellite images;2. Historic population density data in digital images for 20 U. S. cities, 1910–2000, based on census tracts;3. Built-up areas of a representative global sample of 30 cities, 1800–2000, from the set of 120 cities based on historic maps; and4. Urban land cover areas of the universe of 3,646 cities that had populations of 100,000 or more in 2000, based on satellite images. The key findings show that on average, densities in developing countries are double those in Europe and Japan, and densities in Europe and Japan are double those of the United States, Canada, and Australia; and that on average, the annual growth rate of urban land cover was twice that of the urban population between 1990 and 2000. Most of the cities studied expanded their built-up area more than 16-fold in the twentieth century. At present rates of density decline, the world’s urban population is expected to double in 43 years, while urban land cover will double in only 19 years. The urban population of the developing countries is expected to double between 2000 and 2030 while the built-up area of their cities can be expected to triple. The research suggests that preparation for the sustainable growth of cities in rapidly urbanizing countries should be grounded in four key components: the realistic projections of urban land needs; generous metropolitan limits; selective protection of open space; and an arterial grid of roads spaced one kilometer apart that can support transit. 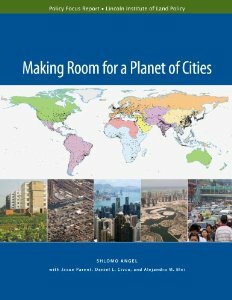 Making Room for a Planet of Cities provides both the conceptual framework and, for the first time, the basic empirical data and quantitative dimensions of past, present, and future urban expansion in cities around the world that are necessary for making minimal preparations for the massive urban growth expected in the coming decades.